Silvia is a senior economist in the European Economics team, focusing on the Southern Euro area countries and contributing to thematic research of the team. Previously, she was the senior Foreign Exchange (FX) strategist on the Global FX and Emerging Markets Strategy team in London. 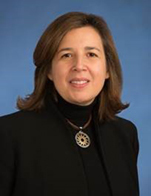 Silvia joined Goldman Sachs in 2012 as an executive director in the Global Macro and Markets Fixed Income Research team focused on rate markets globally and contributed to the research and strategy of developed rates markets. She was named managing director in 2013. Prior to joining the firm, Silvia worked at Bank of America Merrill Lynch as senior European economist from 2010 to 2011. Before that, she was an associate professor at the Department of Economics of Harvard University from 2004 to 2010. Silvia has been a visiting fellow at the European Central Bank Fiscal Policy Division and at the International Monetary Fund Fiscal Affairs Division. She is a leading expert in the area of fiscal policy. Her academic research has been published in top refereed journals and has been influential in shaping the policy debate around fiscal issues. Silvia earned a BA in Economics and an MA in Economics from Universita' Bocconi, Milan, in 1994 and 1995, respectively, and a PhD in Economics from Boston College in 2000.